More and more websites embed structured data describing for instance products, reviews, blog posts, people, organizations, events, and cooking recipes into their HTML pages using markup standards such as Microformats, Microdata and RDFa. This development has accelerated in the last two years as major Web companies, such as Google, Facebook, Yahoo!, and Microsoft, have started to use the embedded data within their applications. 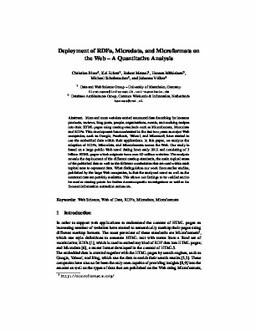 In this paper, we analyze the adoption of RDFa, Microdata, and Microformats across the Web. Our study is based on a large public Web crawl dating from early 2012 and consisting of 3 billion HTML pages which originate from over 40 million websites. The analysis reveals the deployment of the different markup standards, the main topical areas of the published data as well as the different vocabularies that are used within each topical area to represent data. What distinguishes our work from earlier studies, published by the large Web companies, is that the analyzed crawl as well as the extracted data are publicly available. This allows our ﬁndings to be veriﬁed and to be used as starting points for further domain-speciﬁc investigations as well as for focused information extraction endeavors.